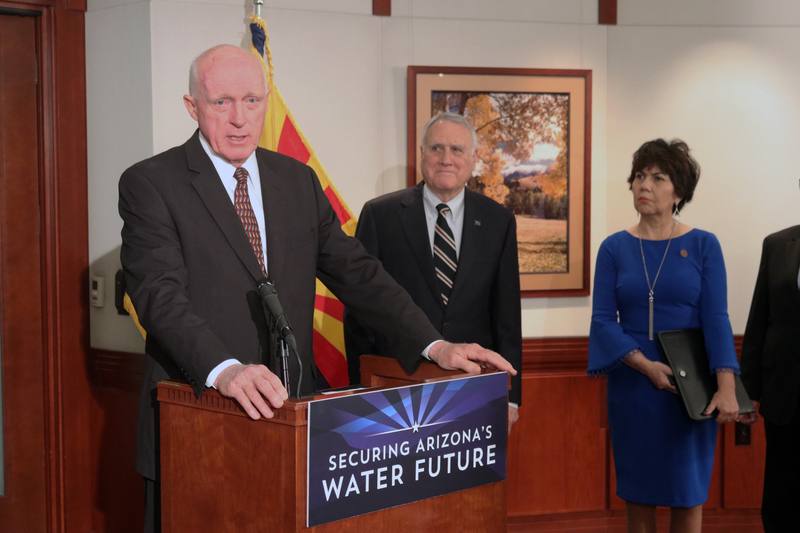 As the federally imposed deadline for the seven state drought contingency plan reaches its conclusion, Arizona lawmakers now have six bills related to the plan to debate and pass. Earlier this month, Gov. Doug Ducey, flanked by Democratic and Republican leaders, urged lawmakers to approve the drought contingency plan before the Jan. 31 deadline. The plan is part of a seven-state agreement, which also includes Mexico, that would see all of them adopt new restrictions and changes to keep the Colorado River from reaching an all-time low. A federal deadline of Jan. 31 was imposed on the deal late last year. A similar version of the deal fell through in 2016. All seven states must pass legislation approving of the plan and outlining the finer details by that day. Arizona is the last to approve of some form of the plan and the only one that requires legislative approval. The six bills have a wide range of impacts from appropriating money for ground water infrastructure in Pinal County to amending the way the state banks water. In addition to the six bills, the legislature also has to approve a joint resolution that gives the director of Arizona’s Department of Water the authority to execute deals with the other states for the drought contingency plan. If the legislation is approved, it will go into effect immediately. House Bills 2540 through 2545 represent the main agreements Arizona has to abide by, per meetings between all the stakeholders involved in multi-state drought planning process. Each one has a varied effect, but the main goal behind all of them is to lessen the impact on the Colorado River and Lake Mead. House Bill 2540, proposed by Rep. Gail Griffin, R-Hereford, would aid in establishing additional funds to help in the creation of groundwater infrastructure in Pinal County. The bill readjusts the way the state appropriates these funds and strikes certain older amendments such as reducing fees for removal of groundwater and waiving that fee until 2026 for areas of Pinal County that are considered active management areas. Active management areas are places that rely heavily on mined groundwater, so the state will step in and manage that water in the most appropriate ways. The bill also stipulates that any money collected in the process of managing that area will go toward well and groundwater infrastructure in Pinal County. House Bill 2542, introduced by House Speaker Rusty Bowers, R-Mesa, expands what credits can be earned from banking water to banked groundwater sources. House Bill 2543, introduced by Griffin, gives the director of Water Resources the authority to “distribute or extinguish” certain long term water storage credits earned if it is beneficial to maintaining an active management area. It would waive certain fees if this were to happen. The bill also gives the director of Water Resources more authority on making deals with banked water, but the law will expire after 2030. House Bill 2544, introduced by Bowers, adds more definitions to effluent water sources, how they can be recharged and certain credits that can be gained from banking said water. Effluent water is most commonly referred to as treated wastewater. It is often used on Phoenix-area golf courses and is even used on agricultural sites after it has been properly treated. House Bill 2545, introduced by Bowers and co-signed by Griffin and Charlene Fernandez, D-Yuma, is the main piece of legislation that contains all the above measures and makes up the drought contingency plan. The legislature has until Thursday to finalize the plan before the federal government’s deadline which if not met, could mean drastically different deals for the seven states involved. The House Natural Resources, Energy and Water Committee is expected to hear and vote on the bills as well as the joint resolution Tuesday afternoon. Reporter Jerod MacDonald-Evoy joins the Arizona Mirror from the Arizona Republic, where he spent 4 years covering everything from dark money in politics to Catholic priest sexual abuse scandals. Jerod has also won awards for his documentary films which have covered issues such as religious tolerance and surveillance technology used by police. He brings strong watchdog sensibilities and creative storytelling skills to the Arizona Mirror. I don’t get it, pumping ground water will only lead to long term shortages, more subsidence and more earth fissures – significant issues in the East Valley and Pinal County. All for what? To keep in business some politically powerful farmers who grow water intensive subsidized crops like cotton? Bad idea, better the farmers switch to a less water intensive crop. The insanity of all this is that they are allowing fracking to take place right over the Coconino Aquifer, little Colorado River and other aquifers and surface waters that flow into the Colorado and Lake Mead. This will result in unimaginable amounts of water being used to frack wells that once used is toxic forever. This also runs the risk of contaminating said water sources that feeds a population of 40 million people down stream. I’d rather the farmers get the water than the frackers! Please view and share this short documentary explaining what’s going on in the Holbrook Basin which will impact all of AZ water.